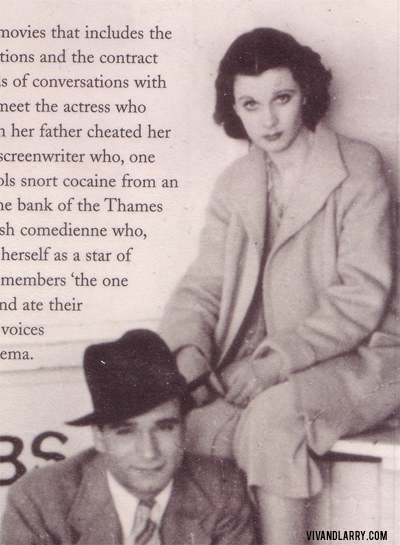 • Shepperton Babylon: Dean Lobbied Korda to secure Laurence Olivier for the picture, and got him–but the head of London Films vetoed his choice of the Norwegian ballerina Vera Zorina for what Dean referred to steadfastly as ‘the Albanesi part.’ Galsworthy’s widow, Ada, expressed herself delighted when Vivien Leigh was awarded the role, but Dean was less sure of the appointment, and his misgivings are visible on the screen. Leigh’s hardness is inimical to the part. Olivier, twittering, wringing his hands and pawing at his temples, seems inexpressibly more fragile. The finale of the film sees Olivier staggering toward a Soho police station to turn himself in for the accidental killing of Leigh’s husband. Leigh, who has just heard that the suicidal down-and-out wrongly convicted for the crime has died on his way to prison, storms through the streets to prevent her lover from confessing. She succeeds, of course, and Olivier stumbles down the stairs of the police station and into her arms. Delicate, doomed Maggie Albanesi would have done nothing so forceful. Dean suspected that acting as host to Leigh and Olivier’s real-life affair would disrupt the production process, and he was right. Stuart Freeborn, the film’s make-up artist, banned Olivier from his room: once Freeborn had finished his work on Leigh, Olivier would bustle in and kiss her until her face was a mess of powder and lipstick. 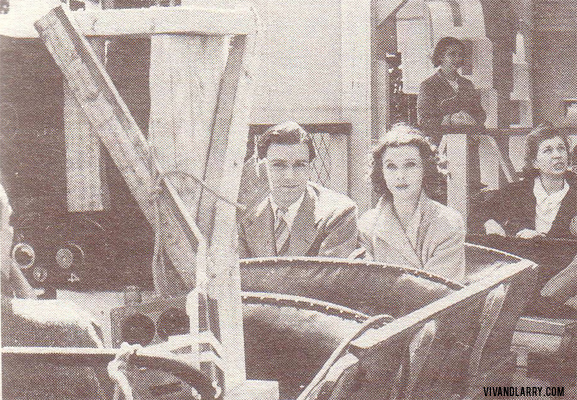 The couple refused to take the film seriously, and photographs taken on location–Olivier and Leigh perched on a Southend whelk stall, or sitting in the carriage of a roller coaster–conjure the larky atmosphere in which its director refused to participate. 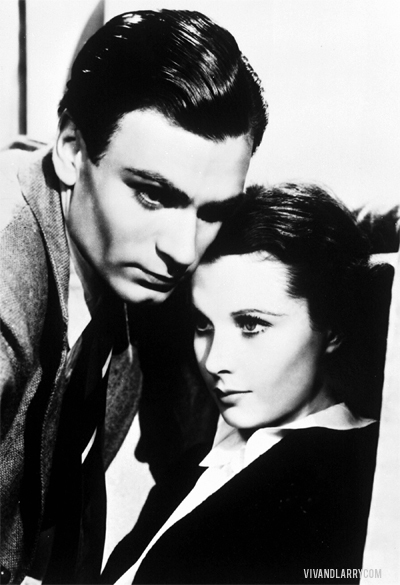 • 21 Days Together, based on the play First and the Last by John Galsworthy, was the second film pairing Vivien Leigh and Laurence Olivier together. The film ran over budget, and the stars did not take the production seriously. The end result was not a successful one. 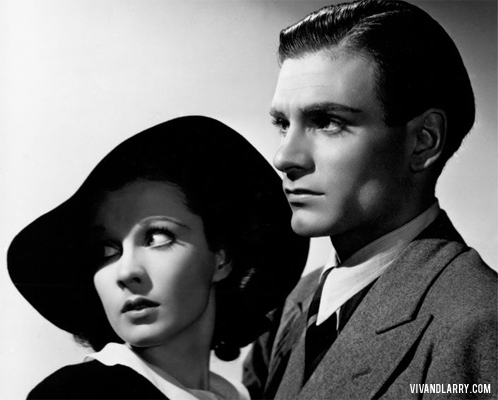 The film was shelved for two years after completion and only released in 1940 after Vivien Leigh’s success in Gone with the Wind (1939) assured it might be somewhat of a success financially. Apparently Larry and Vivien were so displeased with the final product that they both walked out in the middle of a screening. 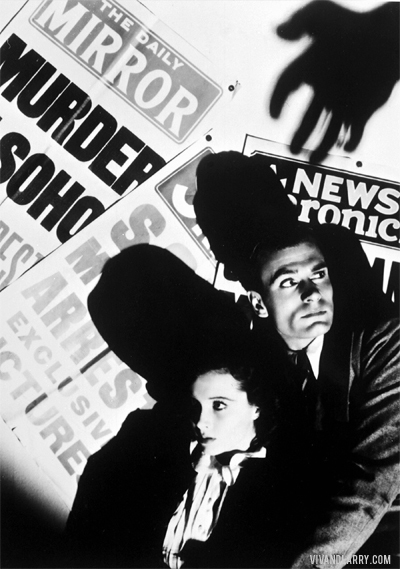 21 Days Together is a reissue of Columbia’s two-year-old, British-made movie version of one of John Galsworthy’s ponderous gibes at justice. The Lord Chief Justice of England and associate bigwigs are made to appear as a clique of underbrained, overfed dodos. 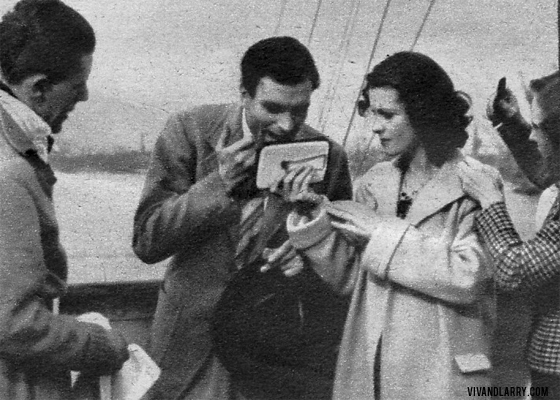 The antics of a desperate adolescent (Laurence Olivier) who gets mixed up with a White Russian girl (Vivien Leigh), inadvertently kills her bigamist husband, appear somehow noble. The lifelong efforts of his elder brother (Leslie Banks) to make a career on the British bench appear some how ignoble. Occasionally tense, usually laggard, 21 Days Together will chiefly thrill devotees of the Leigh-Olivier Liebestraum. It is reported to be the picture which first brought the pair together. 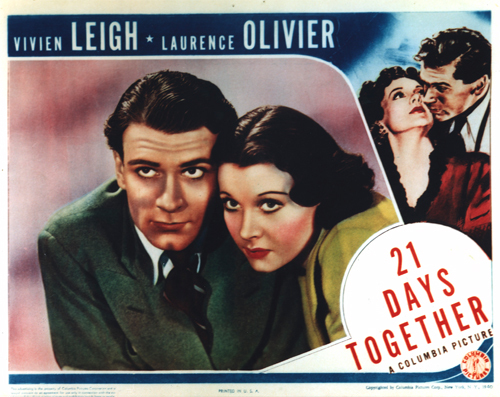 Considering their recent film successes, Mr. Olivier and Miss Leigh are on a spot, and it is gratifying to report that “21 Days Together” does not let them down, nor they it, which is not generally the case with such intentionally delayed products. True, it is no deathless drama—is little more than a cultivated penny-thriller, in fact—and Miss Leigh, as the party of the second part, is required to devote her charm and talents to nothing more constructive than making the apparently inevitable parting from poor Mr. Olivier seem exceedingly painful, indeed. But it is a highly charged “meller,” rigid throughout with suspense and nicely laced with much tender emotion. The story is simply that of a scapegrace but amiable English chap who accidentally murders the swinish husband of the girl he loves, resolves to surrender himself to the police when an innocent wretch is picked up for the murder, and then spends three haunted weeks with his beloved while the supposed murderer is undergoing trial. That which happens when he finally goes to give himself up is no shattering surprise—and no great shakes of a climax either—but we’ll play fair and keep it a secret. Obviously, Mr. Dean has fetched his precept from the aforementioned Mr. Hitchcock in directing for flavor and terrifying suspense. The pace is slow, even casual, with incidental business dropped in with ominous suggestiveness. The mean streets of London, a fog-shrouded alley, night prowlers, a crowd on a Thames excursion boat are given genuine solidity. The painful details of a court trial are worked through with cumulative nervousness. The whole fabric tautens imperceptibly until the final — and anti-climactic — snap. Mr. Dean has done a good job. Mr. Olivier, who is a great one for tension, never lets you feel for a moment that his isn’t a tortured soul—and well it might be, with Miss Leigh and all her tantalizing graces slipping momentarily away from him. Leslie Banks as the murderer’s dignified brother, Francis L. Sullivan as the innocent suspect and a company of excellent English actors give added distinction to the film—you know, the way they always do in a literate, cultivated English melodrama.